I’ll be sharing details on my everyday skincare and beauty routines in the coming months, which I’ll update and re-share periodically, but I also wanted to start up a new series: Empty Bottle Diaries. I know not all products are the kind that you use up entirely, but I’ve been trying to do exactly that whenever I’m trying – and liking – a product. I’ve learned over the past year or two that you can’t really tell it a product is working unless you try it out for a few months. And once I like a beauty product, there’s no point in changing it up until I try something I like something better. So, with that, today I’m sharing a few products that I’ve stuck with and have actually repurchased after they were gone. Urban Decay Perversion Mascara: I got a taste of this mascara when I got a sample at Sephora and have been hooked ever since. I’m not the type to be loyal to one mascara (I tend to switch it up depending on if I’m going to work or out for the night/a special occasion – or I layer different types), but once I have a good experience with a mascara, I usually go back to it and buy again. Urban Decay is probably most known for their Naked eye palettes (which I also love! ), but this mascara was actually the first product I tried from the brand. I think this is the perfect everyday mascara because it’s the perfect blend of volumizing and lengthening. I like to put on one coat before work or when I’m being casual (paired with my Lash Boost that I apply each night for longer, fuller lashes) and I’m good to go. My lashes are very blonde, so I look asleep with zero mascara! I’ll add another coat and sometimes another mascara before or after if I’m going somewhere else. Burt’s Bees Eye Makeup Remover Pads: Finding a good eye makeup remover has been a struggle for me for years. Either they’re not good enough and I end up scrubbing so much that I lose an eyelash or they’re way too oily. With these, you get a natural, gentle wash that still removes the makeup, even waterproof (just need a little more patience). Extra bonus: they have no added fragrance and are free of parabens, phthalates, SLS and petrolatum. And they don’t leave behind an oily residue that makes it so you have to wash again after the makeup is gone. But even with the best eye makeup removers, be gentle to your lashes, eyelids and under your eyes! That skin under and around your eyes is so thin and sensitive. Rodan + Fields Unblemish Sulfur Wash: I went through a phase a couple of years ago where, after not having acne for my entire life, I suddenly started getting it here and there. I guess this is what happens when you hit 30, but I was not a fan. I wasn’t ready to fully commit to a full acne skincare regimen, so I decided to try out a face wash first. Ever since then, I haven’t turned back. I use this once a day – and 2-3 times a week, I use my Microdermabrasion Paste as an exfoliator (I put it on before I get in the shower then rinse off) and then this face wash as a mask for 5-10 minutes afterwards. I have several friends (and customers – I’m a R+F consultant) who also swear by this stuff as well. I’m not writing this to sell anything, but if you do want to learn more, try it out and save 20%, shoot me an email at katy@dailykaty.com – always happy to help! Tula Volume Defense Wrinkle Serum: Keeping your skin hydrating is so important. If you do that, you’re one step closer to staying wrinkle-free. But if you need a little help, this serum is a great place to start. It’s a milky, concentrated serum that uses natural probiotics with retinol and Vitamin C to reduce the appearance of wrinkles. I applied a thin layer on my face after the above face wash and then use a day or night moisturizer afterwards depending on the time of day. I love how this serum is hydrating but also sinks into your skin pretty quickly so you don’t have to wait too long to apply moisturizer. Tula is a brand I love because their products are not only clean and safe, but they’re also effective and actually work. 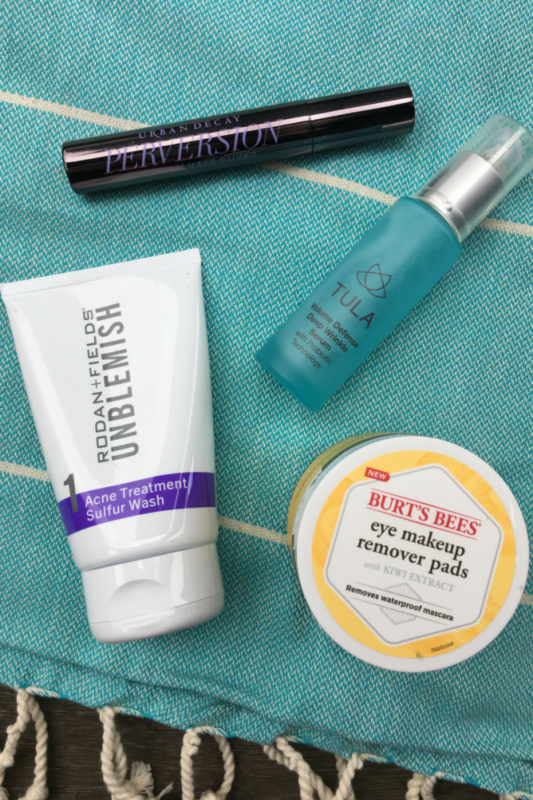 I have a hard time actually sticking with better-for-you beauty products when they don’t work – and that is not the case with Tula. Next on my list to try from Tula is their Kefir Ultimate Moisture 3pc Collection, which features all three of their full-sized Kefir Products – Kefir Replenishing Cleansing Oil, Moisture Repair Pressed Serum + new Ultimate Recovery Mask. The bundle is only $65 for the month of February – and it’s worth $153! Thank you to Urban Decay, Burt’s Bees and Tula for providing samples for me to try out. I am a Rodan + Fields consultant and this post also contains affiliate links, which means that if you click the links and make a purchase, I’ll earn commissions. As always, all opinions are my own.